It’s no secret that I have a passion for learning that extends far beyond the classroom. Learning opportunities surround us in every aspect of life which gives us ample opportunities to help shape our children’s love for learning! The blessing and curse of technology is that we cannot seem to escape it – nor do I want to! But balance and intentionally choosing what you allow your children to interact with is key and can truly be an amazing tool to work with and learn from. 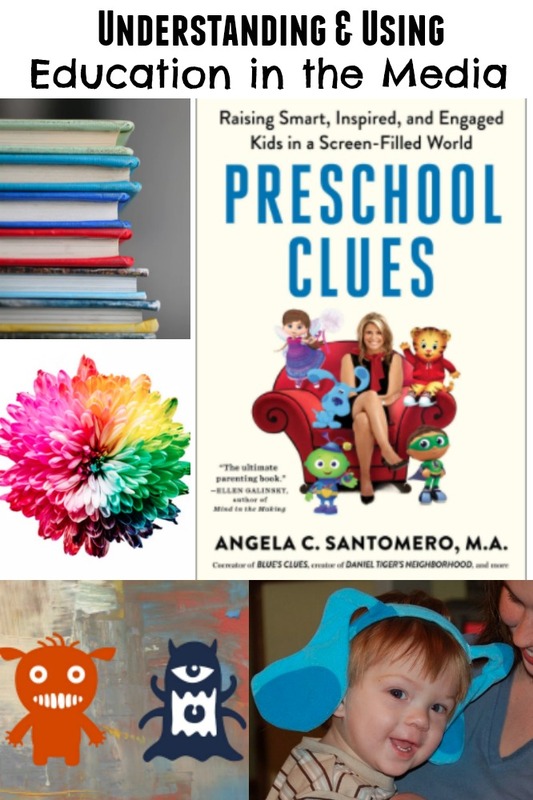 Angela Santomero, co-creator of Blue’s Clues and creator of Daniel Tiger’s Neighborhood, has a brand new book coming out on April 3rd called Preschool Clues: Raising Smart, Inspired, and Engaged Kids in a Screen-Filled World. You can pre-order it here! Angela Santomero has a lifetime of experience when it comes to edutainment for children. She has honed in on the ability to use technology in teaching integral developmental skills and character building qualities with favorite characters that children love. Her new book, Preschool Clues, is an explorative data driven guide for educators and parents alike. She explores the importance of teaching our children (her young viewers!) social, emotional and cognitive skills with concrete strategies and the help of media and play. 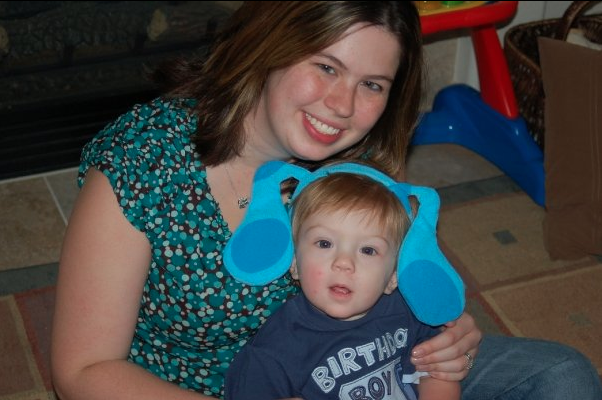 Many of you know that my oldest son (above at 1 year old – he’s now 11!) has autism (Asperger’s) – and my goodness were those toddler/preschool years tough! When my son was little I used high quality TV shows like Blue’s Clues and Daniel Tiger’s Neighborhood as a tool to reach and teach my son developmental skills he was struggling in. Social skills groups helped him tremendously but so did his favorite TV character’s like Blue and Daniel Tiger. It allowed him to have a better visual component to provide a more complete picture in his learning process. them. I’ve looked back at all the research that proves the success of using media to teach, influence, and inform. Life, and learning, is all about balance! 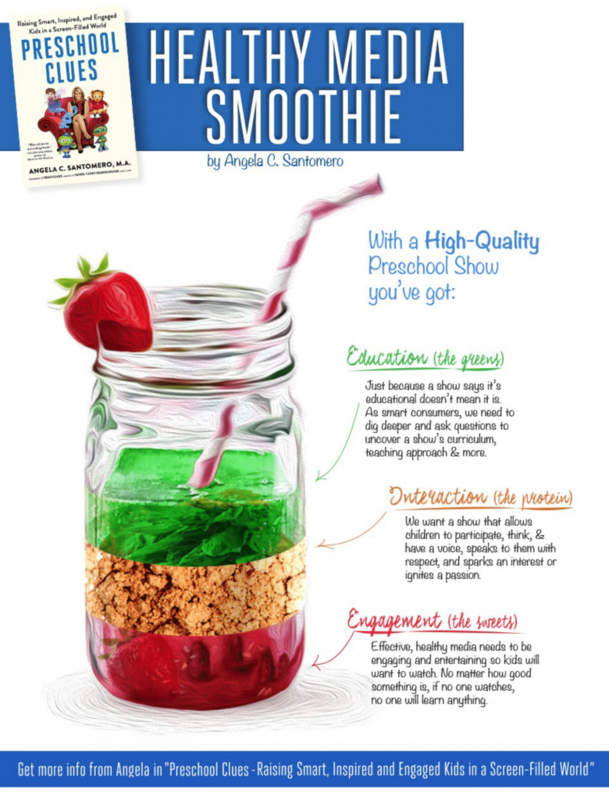 In the “Healthy Media Smoothie” infographic above you’ll notice that using Education, Interaction AND Engagement can provide a more complete and well rounded “diet”. Media can be an incredibly powerful tool in educating children. It helped me teach my son what to expect in fearful situations (dentist and doctor’s offices), how to respond when he was disappointed at something, and how to react when a friend wasn’t nice. And to be honest many times as a parent I was able to pick up ideas and clues on how to model things in an understandable way for my son! Not to mention it reinforced basic academic skills like counting and learning letters! *Should preschoolers be watching TV? *What exactly is media teaching? *Types of curriculum found in preschool shows. 1. I’m such a huge fan of edutainment and the value it holds not only for our children but also the parents watching. You’ve helped create and inspire amazing children’s shows like Blue’s Clues, Super Why, Daniel Tiger’s Neighborhood and even Wishenpoof – all family favorites in my household! Did you have any dreams of these shows being used as teaching tools in the classroom, preschool, or daycare settings? Or did you focus on these shows expecting them to only be viewed at home? Thank you! My aspirations have always been to use media to complement the best classroom curriculum, especially since my background is in child development psychology and educational technology and media. We work with consultants and in-house formative research to ensure that we are meeting our curriculum series goals. One example of classroom use is Super Why. We have also worked with PBS and the Department of Education on Super Why Reading Camps, which utilize our show paired with a 3-hour-a-day specialized curriculum to teach preschoolers to learn and love to read. Through this, parents, teachers, and caregivers have their own super power — and that’s the confidence to use kids’ media to their advantage in a way that strengthens and supports their role. An added bonus, they can do it guilt-free! But then it gets even better, the research shows that kids who watch Super Why score better on reading tests than kids who don’t, and when you add the specific curriculum materials and lessons, the scores are that much higher. The studies and all materials can be found on PBS’ teacher site to use! 2. Hands on play and exploration is so vital to childhood development. Do you have any specific suggestions on how to pair educational screen time with hands on activities and explorations? Are there any great resources to help parents and/or teachers accomplish this? In my book Preschool Clues, I talk a lot about embracing the media and extending the learning, because when preschoolers play creatively and imaginatively, they are actually practicing key skills. In Preschool Clues, I give examples ranging from dramatic play with props based on the show; to science-based experiments using show content; outings that will take the media curriculum to another level. Even simple ideas such as conversations around the dinner table and asking your preschooler, “What would Daniel Tiger do?” I am currently working on a new book that extends the learning even more with curriculum-based games, activities and insights from my shows! 3. Are there any values or influences from your childhood that have helped shape the passion that you now have today in creating children’s television shows? What was your favorite children’s show as a young child? Mister Rogers’ Neighborhood! I was that preschooler who couldn’t sit any closer to the television set when he was on, I felt like he was talking directly to me! It is a big reason why I use the Pause in my shows too, to pass along those empowering and caring feelings because preschoolers, like any other man, woman or child, love to feel heard. Fred Rogers has been the largest influence on my career — I only hope to reach children with my shows the way he did for generations of kids. 4. What’s your dream for the future? Do you have a character you’ve dreamed of that you want to see come to life? Do you want to break out of television and turn to a different avenue in education? My dream is to continue to find what parents and kids “need” and create media content that will help them navigate the world. We all need more kindness, empathy, critical thinking skills and love – whatever I do next will bring something to the world that leaves kids better off for watching and participating in my brands. 5. 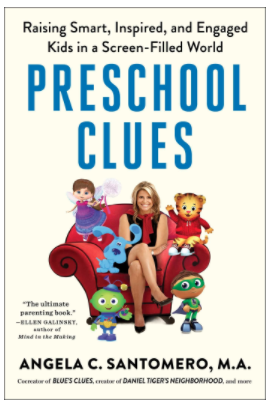 You have a lot of amazing research and information in your new book, Preschool Clues. What is the one thing you want parents and educators to take away from your book? That not all media is created equal! Good quality media can educate, empower, challenge and boost your preschooler’s self esteem – all while making them laugh! I hope readers are inspired to grab the remote and find all of the Preschool Clues inside high-quality preschool TV for both your child and themselves! To learn more about Angela head over to her site at Angela’s Clues.